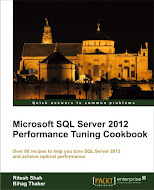 http://www.sqlhub.com for further new tips and tricks of SQL-Server and .NET. I have booked this domain specially for SQL Server blogging. Subquery can be used as a derived table in FORM clause of the T-SQL query. Believe me this is really powerful approach and can bring you out of some difficult situation. I have already previously written some articles on Subquery, you can refer those for getting basic idea about subquery, correlated subquery,CTE etc. Let us create two tables for demonstration and insert some data in it. After finishing above task, let us see how we can get cricketer name, country and his score with simple JOIN clause. We have achieved whatever we wanted. If you observed we have to put every column in group by clause which is not included in AGGREGATE function. In this case, those are Name and Country. What if you don’t want to put those two columns in group by clause as this is something messy sometime. Let us see how can achieve the same results with the help of derived subquery as table. See, we have used subqery in JOIN clause rather than any table and achieved the same results. This technique of relational algebra may prove very powerful sometime in difficult situation. You might have read my previous articles on JOIN as per those articles; JOIN is multiplication of data whereas UNION is addition. UNION does nothing other than stack the data of multiple result sets in one result sets. While using the UNION you have to consider few things like: column name, number and aliases should be mentioned in first part of the SELECT. ORDER BY clause will sort the complete result sets, it will use the column name of first SELECT statement and should be write down after the last SELECT statement. Let us create two demo tables to use UNION. –Isert records in BIKE table. Now, both the select statement of above two tables will be merged and will return single result sets. Above query returns all the records of both tables. Though we gave ORDER BY for CarName but it will sort complete second column which include some data of bikeName as well. You cannot give ORDER BY on BikeName column. Above query was just an example, you can use UNION for less than or equal to 256 tables. This is not at all small amount. Intersection Union: Intersection Union find common row in both data sets. As soon as you read this statement, you will say, ohh, this could be done by INNER JOIN as well. So, the answer is INNER JOIN matches two table horizontally and INTERSECTION matches two datasets vertically. There is one more difference in INTERSECTION and INNER JOIN is that, Intersection query will see NULL as common and includes the row in the intersection and INNER JOIN will not even includes two different row with NULL value in result sets. Now, have a look at INTERSET usage in below query. You will get only one row which is same in both the table. EXCEPT: Except (a.k.a. DIFFERENCE UNION) finds records exists in one data sets and not available in another datasets. In above case we have three records in CAR table but third record is exist in BIKE table as well so EXCEPT will display only first two records. Have a look at below query. Merging data is heart of SQL and it shows the depth of relational algebra as well as the power and flexibility of SQL. SQL is excellent at selecting the data and SQL Developer can be master by understanding the relational algebra. Join seems known technology but it is fun all time. Developer can make very creative query with joins by making data twist and shout. Pulling the data out of join could be the answer of very big code of programming language with iteration. It is much faster than any loop in your code. I promise you will have fun by learning this powerful technique. SQL-Server 2005 is relational database so you always need to join more than one table in order to get complete information out of data tables. Since, tables are self explanatory itself, order of table doesn’t matter. I had one task few months back. I was asked to delete 3 million records from one table containing total of 8 million records. You may think, ohh delete….. simple, execute delete statement with condition and sit back on your chair with relax. J Its not that simple, If I would have done it, I would have lost my database due to many reasons. I don’t want to go in details about those reasons. Let us focus on our main topic. — to perform delete operation. Now, we will create one stored procedure which will delete all records from my table which will meet specific conditions. So, finally we have created stored procedure; now let us see whether it actually works!! !